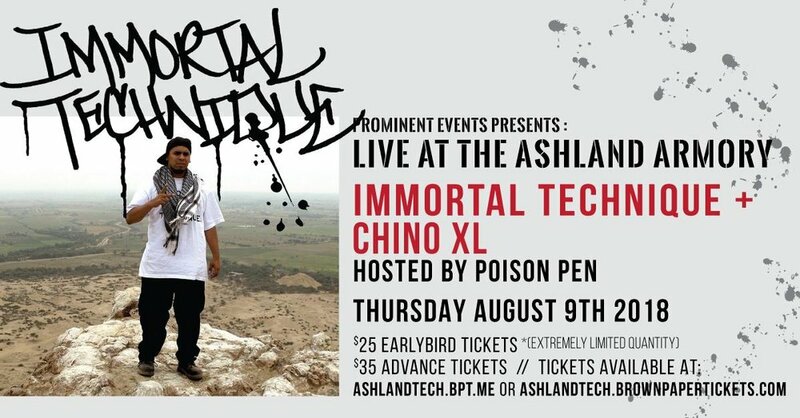 Thursday, August 9th, 2018--Prominent Event Production brings you Immortal Technique and Chino XL, along with local and regional hip hop openers. Bistro food available for purchase, catered by local favorite Plancha. Immortal Technique (NYC) is a Peruvian-American hip hop recording artist and activist. Most of his lyrics focus on controversial issues in global politics. His lyrics are largely commentary on issues such as politics, socialism, class struggle, poverty, religion, government, imperialism, economics and institutional racism. Chino XL (NJ), is an American rapper and actor, known for his "technically" accomplished style, consisting of self-consciously over-the-top punchlines, exaggerated egotism, complex rhyme schemes, and use of multiple similes, puns, metaphors, and word play. He has collaborated on various projects with some of the most well known in Hip Hop. Chino is also an avid bodybuilder. Chino started rhyming in 1986, as said in his song "Don't Say A Word". He has released four solo studio albums, in which his most recent Ricanstruction: The Black Rosary - won the 2012 HHUG Album of the Year award. All persons subject to search. No weapons. No outside food or beverage. No large bags. No dogs. Visibly intoxicated persons will be refused service. No refunds.